The Silicon Thin-Film Applied Research (STAR) group, headed by Professor Karim S. Karim, is utilizing the Giga-to-Nanoelectronics (G2N) to advance state-of-the-art medical imaging by developing faster, higher resolution and lower dose x-ray cameras. These x-ray cameras are based on novel semiconductor devices using amorphous selenium photoconductor material and novel sensor circuits using state-of-the-art silicon complementary metal-oxide-semiconductor (CMOS) technology. Some of the new device architectures poineered in the STAR group were featured in an article on the MedicalPhysicsWeb. Their work on a single photon counting CMOS architectures received an Honorable Mention at the SPIE 2009 International Medical Imaging Meeting in San Diego, California. Find out more at the STAR website. 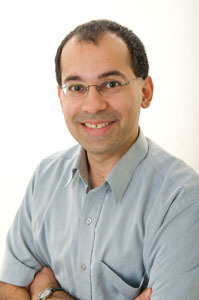 Find out about some of STAR and Professor Karim's publications on our publications page.